Kevin Lee McLaughlin woke up in the early morning hours of April 13, 2017, feeling unwell. The 60-year-old inmate had been in custody in the San Luis Obispo County Jail since late January awaiting sentencing on an assault charge. At 2:30 a.m., he saw a jail nurse for an evaluation. He complained of numbness, tingling, and pain in his left shoulder and arm. "I'm clammy," he said. "I need to go to the hospital." The nurse took McLaughlin's vital signs, which were normal. The inmate wondered aloud if maybe he'd just slept on his arm. McLaughlin, whose jail medical records show that he was being treated for hypertension, was given 1,000 milligrams of Tylenol and sent back to his bed with plans to see a doctor the following day. Less than one hour later, at about 3:13 a.m., a correctional deputy checked on McLaughlin and noticed he wasn't breathing normally. The deputy asked jail medical staff to conduct another evaluation. Five minutes later, that same deputy found McLaughlin unresponsive in his jail bed. An out-of-county medical examiner found that McLaughlin died of a heart attack, the result of chronic heart disease. McLaughlin's death was listed as natural. Most of the inmate deaths in the SLO County and Santa Barbara County jails have been classified as natural. They made up more than half of the 41 inmate deaths at the two facilities over the last 18 years. New Times' review of dozens of coroner's investigation reports and medical examiner autopsies revealed that many of those inmates suffered from serious chronic medical conditions. Advocates and some inmates' families have accused both jails of violating inmates' constitutional rights by providing substandard health care. The FBI is currently investigating the SLO County Jail for civil rights violations, while a federal class action lawsuit was filed against the Santa Barbara County Jail over conditions for sick and disabled inmates. Amid increasing pressure to address the issue, the sheriff's department and officials in both counties say they are working on reforms at both facilities, aiming to improve care and cut down on inmate deaths. Johnny DeWitt, 49, had been in the Santa Barbara County Jail for nearly three months when he got into a verbal argument with another inmate on the morning of Nov. 26, 2015. DeWitt—who'd been arrested for making violent threats—suddenly grabbed his chest and collapsed. He fell into the arms of another inmate and and was placed on the ground. The inmates yelled out to nearby deputies. At 8:55 a.m., a "man down" call went out over the jail's radios. DeWitt lost consciousness and stopped breathing while custody and medical staff were trying to evaluate him. They started CPR. Emergency Medical Service workers arrived and spent 45 minutes trying to revive him. An ambulance took DeWitt to Cottage Hospital in Santa Barbara, but he never regained consciousness. At 10:53 a.m., DeWitt was declared dead. An autopsy determined that DeWitt's death was natural: a heart attack. Autopsy records stated that he suffered from coronary artery disease, hypertension, and diabetes, conditions further complicated by a history of methamphetamine use. A review of deaths at the Santa Barbara Couinty facility showed that more than half of the 21 inmates who died in the jail since 2000 suffered from at least one type of chronic medical condition. That total includes seven deceased inmates who suffered from hypertension, four with heart disease, and four diagnosed with hepatitis C. In addition, the records showed three inmates had documented histories of diabetes, and another three suffered from cirrhosis. 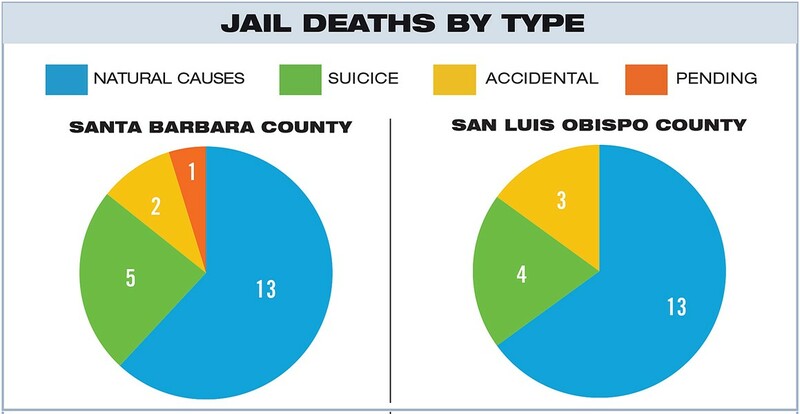 JAIL DEATHS BY TYPE Santa Barbara County: Coroners reports show that 21 inmates died in the Santa Barbara County Main Jail between 2000 and 2018. Most of those deaths were classified as "natural," with deceased inmates suffering from a variety of chronic illnesses. SLO County: Since 2000, 20 inmates have died in the SLO County Jail. Many of those deaths were classified as natural. However, the families of some inmates dispute those findings and believe that poor medical care and negligence may have caused or hastened some of those deaths. Records on SLO County's inmate deaths show many of the same medical conditions. Of the 20 inmates who died in custody since 2000, more than half had at least one documented chronic medical condition. Among those, five suffered from heart disease, and two were diagnosed with high blood pressure. Three had liver-related conditions including cirrhosis, and another two were diagnosed with hepatitis. At least two were diagnosed with cancer, but only one had it listed as their cause of death. "We see a lot of heart disease, we see a lot of cancer," said Dr. Christy Mulkerin, the SLO County Jail's new chief medical officer. "We see a lot of liver disease and ton of diabetes." While such diseases aren't uncommon, Mulkerin and other SLO jail officials said that chronic illnesses within the inmate population tend to be more severe. For many inmates, medical conditions often go undiagnosed or untreated prior to their arrest and are exacerbated by homelessness, drug use, alcohol abuse, or other factors. "When they come in, they come in directly off the street," said SLO County Undersheriff Tim Olivas. "It's not just a high-risk population, it's probably the highest risk population." Inmates can request medical services by either asking a guard or submitting a written form known as a "kite." Mulkerin said in the first two months of 2018, the jail received 1,345 medical requests to triage and prioritize. Santa Barbara County jail staff field more than 12,000 requests for health services each year, according to California Forensic Medical Group, a company currently contracted to provide mental and medical health care at the jail. Both jails are limited in what health care they can actually offer. Part of that is due to the facilities themselves. Santa Barbara County Sheriff Bill Brown said his jail did not have a dedicated medical clinic, but a "hodgepodge" of exam rooms spread throughout the jail, which was built in the 1960s. Brown said inmates can get the basics: physicals, check-ups and exams, and intervention and treatment for minor injuries or illnesses. "But if it's anything more than that, it requires us to take them out of the jail to a hospital or a specialist," Brown said. "If it's an emergency, or if they need regular dialysis, or have cancer and need chemotherapy, that's also offsite." The SLO County Jail's Stahl Hall, a medical and mental health clinic, provides a similar level of care. Mulkerin said Stahl's single examination room doesn't have "monitored beds," where an inmate can be placed for an extended period of time and have their vital signs tracked. "We can't do that right now because that person would be taking up our one exam space, and we can't see anyone else," she said. At both jails, inmates are transported to the hospital by deputies, or in the most severe or life threatening cases, by ambulance. According to Mulkerin, the jail recorded 59 hospital emergency room visits in the first three months of 2018. Inmate death records showed that seven of the 20 inmates who died in SLO jail custody were transported to a hospital, while 14 of the 21 inmates who died in Santa Barbara custody were transported to a hospital prior to their deaths. John Kelly entered the Santa Barbara County Jail in March 2013 on a DUI charge. A type 2 diabetic, Kelly said he figured the jail and its staff would simply keep him on his treatment and medication schedule. Instead, he claims that the poor quality of care in the jail turned the 2 1/2 month sentence into a fight for his life. "I understand I had a debt to society, but I never expected the kind of torture it was," he said. Kelly described trying to get medical care in the jail as a "tug of war." While on the outside, Kelly took insulin before every meal. Inside, he was allowed two injections each day. He filled out and submitted kites, but appointments were few and far between. At one point, Kelly said the jail ran out of a long-lasting brand of insulin he and other prisoners used. For the next 10 days, they replaced it with insulin that didn't last as long but never changed his dosage to make up for it, according to Kelly. His condition deteriorated, at one point becoming so severe that Kelly said he had to be rushed to a nearby hospital. As a result, Kelly said he spent much of his time in jail on a roller-coaster ride of blood sugar highs and lows, leaving him worried that he might slip into a diabetic coma or worse. "It was a complete nightmare," he said. "I was pretty sick the entire time." Concerns about medical services at the Santa Barbara County Jail surfaced in 2008, when a grand jury report on the facility stated that many inmates' complaints to the American Civil Liberties Union noted a lack of attention to inmates' ailments or pain and delays in getting medical attention. The grand jury also found that jail medical records were still handwritten and that staff had no access to online medical records for inmates. In 2017, Dr. Scott A. Allen conducted an independent review of the jail's medical services. Allen is co-director of the Center for Prisoner Health and Human Rights, and his review was commissioned jointly by Disability Rights California and Santa Barbara County. A number of Allen's findings echoed the 2008 grand jury report. Allen's report also found that staffing was inadequate, that physician availability was limited to just three days a week, and that the jail lacked protocols to manage ongoing care for chronically ill inmates. "Chronic disease management is inadequate," Allen wrote. "My review found management of chronic illnesses such as asthma, diabetes, HIV, and hypertension, among others, to be ad hoc, incomplete, inconsistent, and reactive as opposed to proactive." In December 2017, Disability Rights California filed a federal class action lawsuit over substandard conditions in the jail. The organization alleged that Santa Barbara County and the Sheriff's Office failed to provide adequate medical care to inmates housed in the jail. The suit draws on Allen's findings and alleges that custody staff refused to provide or deliver sick call forms to medical staff and that the jail's south dormitory, which houses prisoners with serious medical needs, was dirty and crowded, with some chronically ill inmates forced to sleep on small plastic beds on the floor. In SLO County, a grand jury raised concerns about medical services for inmates at the SLO County Jail after a string of high-profile inmate deaths in 2016 and 2017, including McLaughlin's. According to a 2017 report, the grand jury sought significant and detailed information about inmate health and safety but found it difficult to obtain that data. "In some cases, we were told it was simply not available," the report stated. The report attributes the lack of information to multiple agencies being responsible for inmate health care, including the Sheriff's Office, SLO County Drug and Alcohol Services, and the SLO County Public Health Agency. "Such a structure raises a concern about how well various aspects of inmate care are coordinated, especially when health issues cross multiple boundaries such as drug abuse, psychiatric care, and ongoing medical issues," the report stated. As part of a process to reform the jail's medical and mental health care services, SLO County commissioned an independent review and evaluation of those services from Dr. Alfred Joshua, chief medical officer for the San Diego County Sheriff's Office. While the county and SLO Sheriff's Office used Joshua's findings to craft a number of reforms, including hiring SLO jail CMO Mulkerin, they refused to release the evaluation, denying a New Times Public Records Act request for the document. A legal claim filed against the county by McLaughlin's family accused the county of "decades-long deliberate indifference" to the medical needs of inmates. The claim alleged that the jail suffered from a lack of adequately trained staff; failed to develop and implement policies and procedures for how to care for ill inmates; and kept incomplete, illegible, and inadequate health records. "[McLaughlin] entered the jail as an elevated health risk," the claim against the county stated. "[McLaughlin's] medical condition otherwise would have been manageable with proper medication and timely and professional treatment, including a transfer to a hospital for more specialized and acute care." The county rejected the claim in November 2017. The family has until May to file a lawsuit. Twenty-five percent of the medical malpractice claims filed against SLO County in the last 20 years were related to the jail. 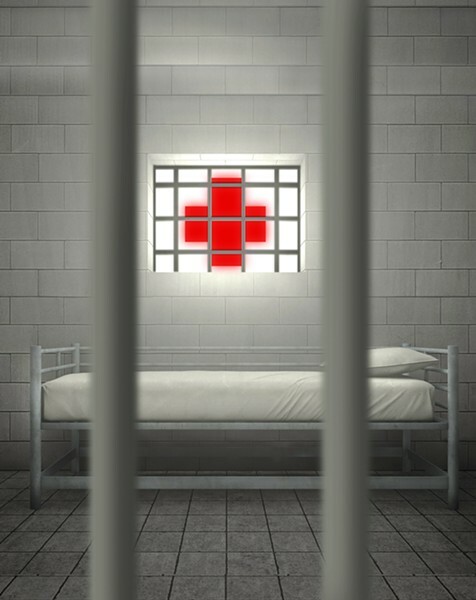 Of those jail-related claims, nearly half alleged negligent or denied medical care. Ryan James Johnson wasn't surprised by the allegations. Johnson, 41, spent time in the jail in 2012 while on trial for first-degree murder. "The level of care at SLO County Jail, I believe, is meant to just get people through with the bare minimum," Johnson, who is now serving a 26-years-to-life sentence in a state prison, wrote in response to questions from New Times. "I believe that the medical care is designed to focus on temporary treatment to essentially stabilize the person until they can pass them off to the next destination." William Meredith Harvel, 73, was disoriented and confused when he was booked into the SLO County Jail on Feb. 18, 2008, for negligently discharging a firearm. In addition to showing signs of dementia, Harvel suffered from a number of serious medical conditions including hypertension and prostate cancer. He was put in a wheelchair and placed in a medical isolation cell. Eight days later, an X-ray revealed that Harvel had an enlarged heart and was suffering from congestive heart failure, mild pulmonary vascular disease, and possible pneumonia. On Feb. 27, 2008, Harvel began having difficulty breathing and was hyperventilating. He was given a paper bag to breath into, which gave him "some relief." Four days later, at about 6 p.m., an inmate worker who was mopping the floor said he saw Harvel place his feet on the floor and try to lean forward into a sitting position on his bed. Harvel fell back and hit his head against the wall behind him, slumping over on his side. The inmate alerted custody staff, who went to the cell to assess Harvel. 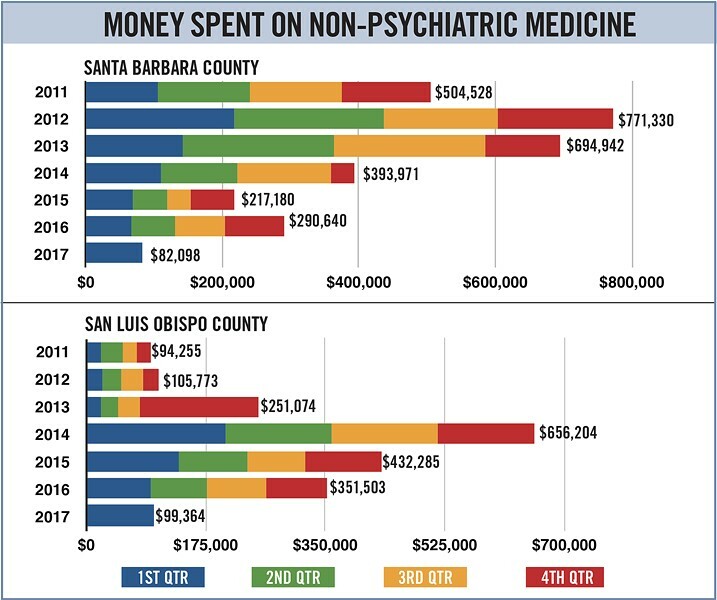 MEDICATED Both the SLO County and Santa Barbara County jails spend hundreds of thousands of dollars on non-psychiatric medication for sick inmates. Jail officials say that many inmates enter the jail suffering from chronic conditions such as heart disease, diabetes, hepatitis C, and other illnesses that require regular medication. He became unresponsive. Twelve minutes later, medics arrived, but life-saving efforts were unsuccessful. Harvel was pronounced dead at 8:29 p.m. An autopsy lists his cause of death as congestive heart failure. Although his death may have been natural, the coroner's report doesn't specify whether it may have been preventable. The report does state that the jail had access to both his medical records and medication regimen as early as four days after he was booked into the jail. The coroner also noted that Harvel was not given any medications during his incarceration, but didn't say what role that may have played in his death. Records from SLO County's legal counsel show an administrative claim related to Harvel's case was filed in March 2008 and closed in September of the same year. The claim itself was not available, as California state law allows older claims to be destroyed. A decade later, the claim filed by McLaughlin's family alleged that a lapse in medical care may have led to his fatal heart attack. In addition to stating that jail medical staff failed to recognize that he was having a heart attack, the claim alleged that McLaughlin was given medication that hastened his death. Health records included in the claim showed that McLaughlin was prescribed ibuprofen during his stay at the jail. The claim pointed out that in 2015, the FDA issued a drug safety notification that non-aspirin nonsteroidal anti-inflammatory drugs (NSAIDs), which include ibuprofen, increase the chances of or even cause heart attacks or strokes. The agency issued similar warnings in 2005. The FDA's announcement also stated that patients with heart disease or risk factors for it have a greater likelihood of having a heart attack following NSAID use. According to his jail health records, McLaughlin was already taking medication for high blood pressure and hypertension, but was also prescribed a 1,200 milligram daily dose of ibuprofen for seven days in January and again in February for five days. "It should have been known to jail personnel since 2005 that even short-term use of NSAIDs elevated blood pressure and could cause heart failure," the claim stated. Tracking lapses in care related to inmate deaths is something that California's state prison system has been doing since 2008, and state prison medical officials believe that collecting that data led to a reduction in preventable deaths. Health care at the state's prisons has been in federal court-ordered receivership since 2005, the result of a 2001 lawsuit over the quality of inmate care. "We review all our deaths and look at every single one intensely," said Dr. David Ralston, a regional deputy medical executive for California Correctional Health Care Services (CCHCS), a group currently providing health care at the state's prisons as part of the receivership. According to CCHCS's data, the top three causes of death among the state's prison inmates in 2016 were cancer, cardiovascular disease, and liver disease. CCHCS reviews inmate deaths and makes their findings available to the public via an annual review. According to the reviews, none of the 334 inmate deaths in 2016 were classified as definitely preventable, down from 18 in 2006. The same data shows that the number of possibly preventable deaths dropped from 65 in 2007 to 18 in 2016. Ralston, who oversees medical care at seven California prisons including the California Men's Colony in SLO, said the decreasing number of preventable deaths was, in part, due to the rigorous reviews and tracking of lapses in care. "We really look to see if there was any way we could have improved their care," he said. "Continuous improvement is sort of our mantra." According to CCHCS's data, the most common lapse in 2016 was failure to recognize, identify, or adequately evaluate important symptoms or signs. Mulkerin said that SLO County conducts multi-disciplinary reviews to comply with the state's Title 15 law, which sets minimum standards for local detention facilities. Those reviews include identifying areas of improvement, but the results are not made available to the public. "The confidentiality is a must to ensure that the conversation is frank and productive, without violating the patient's rights and privacy," Mulkerin said. The Santa Barbara County Jail was found to be in compliance with Title 15's death-in-custody review requirement, according to a biennial inspection from the California Board of State and Community Corrections conducted in 2016. However, the December 2017 lawsuit filed against the Santa Barbara County Jail alleges that it failed to adequately review and document deficiencies in care and says that the jail's review of in-custody deaths is inadequate. None of the documents reviewed by New Times—coroner's death investigations or medical examiner autopsy reports related to the 41 inmate deaths—identified lapses in care, nor whether the deaths were preventable. "The defendants do not take the necessary steps to avoid similar treatment failures, and the consequent risks to human life, in the future," the lawsuit states. As scrutiny over deaths at both facilities continues, officials in SLO and Santa Barbara counties have promised the public that they are making reforms. After criticism of its former jail medical services contractor, Corizon, Santa Barbara County chose a new contractor, California Forensic Medical Group. The group began providing services to the jail in April 2017. The company is supposed to help improve care at the jail and help the facility gain accreditation from the National Commission on Correctional Health Care (NCCHC). According to a recent grand jury report, the jail also improved its intake screening process and implemented an electronic health records system. "The dedication of our medical and mental health staff to our patients and county is exemplary," Craig Diamond, a spokesman for California Forensic Medical Group, wrote in an email response to questions from New Times. In addition, Santa Barbara County is building its Northern Branch jail facility in Santa Maria. The $111 million facility will provide 376 beds, 32 of which will be dedicated for mental and medical health. Sheriff Brown acknowledged that pressure from Disability Rights California helped push the county to support and fund those reforms. "They focused on our facility and the levels of services and felt those were inadequate. ... It's really the impetus for doing more than what's been done in the past," he said. Shortly after McLaughlin's death, the SLO County Sheriff's Office announced that it would implement a number of reforms to inmate mental and medical health services at its jail as well. One of the most significant of those was hiring Mulkerin as chief medical officer. With her in place, control of all aspects of inmate care will fall directly under the Sheriff's Office as opposed to being dispersed between multiple agencies. "It's been an amazing shift," Undersheriff Olivas said. "Bringing it all under one person who answers to the sheriff has really solved a lot of problems." The county is currently building a new medical clinic at the jail, which it hopes to open in June. SLO County is considering possibly contracting out jail medical and mental health services, similar to Santa Barbara County, but has not made a final decision. The jail is also working toward NCCHC accreditation. While jail officials say that systemic problems such as a lack of space and resources, and a population with high rates of chronic illnesses make providing care to inmates a challenge, McLaughlin's family's claim said that's not a valid defense for indifference to inmates' medical needs. This article was produced as a project for the 2017 California Data Fellowship, a program of the USC Annenberg Center for Health Journalism. Staff Writer Chris McGuinness can be reached at cmcguinness@newtimesslo.com.